Jesus, the Light of the World, sits at a well during the peak of daylight, noon. 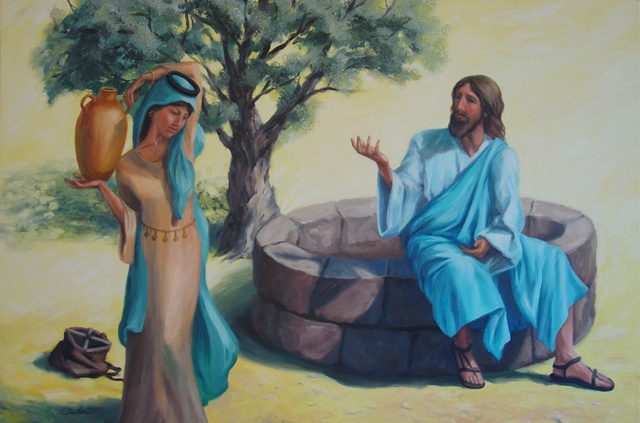 Here, He reaches out to a Samaritan woman. The Samaritans were originally Jews. They did not worship in the temple in Jerusalem which heightened the animosity between the two. Because they had integrated with the five pagan peoples settled in the region and mingled their beliefs with those of the pagans, they could no longer be considered pure Jews. The Samaritan woman had five previous husbands which may be a symbol of this. In the painting, she wears a belt with five hanging ornaments. Today, we think we can safely blend our Christian beliefs with five contrary and prevalent ideas, namely: relativism, New Age, individualism, false-feminism, and false-freedom. In doing so, we will keep returning to the well thirsty and finding the well-water stagnant. In the purity of our Christian faith, Jesus offers us running water, that is, grace through the Holy Spirit. May the Holy Spirit open our eyes that we may divorce ourselves from any ideas not compatible with Christ’s teaching and may we, like the Samaritan woman, be quick to evangelize those who thirst. Only in Jesus do we have light, living water and eternal life.